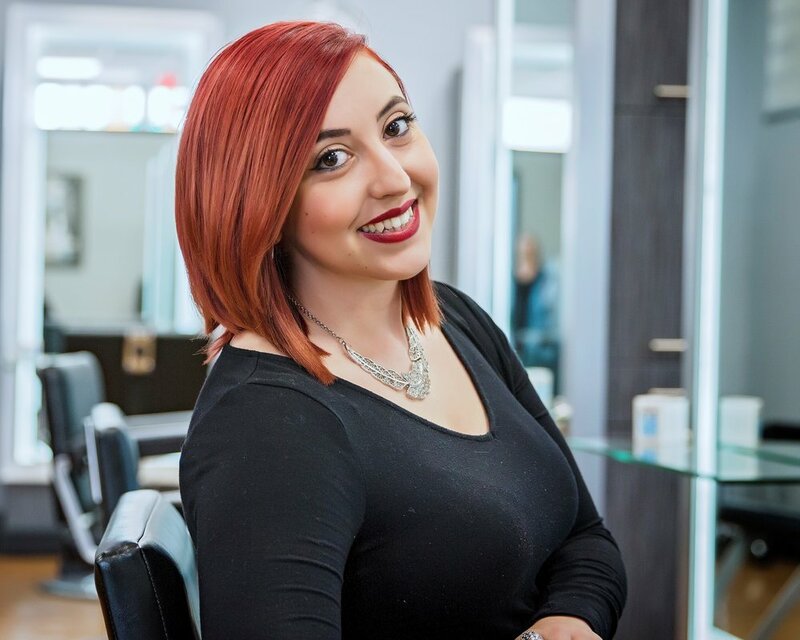 Alicia opened Salon Fleur De Lis in 2011, in doing so her goal is to lead and inspire the next generation of Aveda stylists. She has had the pleasure of training with Aveda both in the salon and at the New York Aveda Advanced Academy. She enjoys styling hair for fashion shows, participating in community events and spending time with her family, but most of all loves styling hair behind the chair! Trista has been a stylist for 9 years, and for the past 6 she has been dedicated to continuing her education with Aveda. She specializes in medium to short precision haircuts, balayage, sun-kissed highlights, special occasion styles, and natural nails. She has a passion for cutting & coloring equally and is always staying up to date with the latest trends. She will always do her best to listen to her guests, she loves making people look & feel their best! Sheridan has 10 plus years experience as a stylist and has worked with the Aveda network the majority of her career. She is passionate about continued education and utilizing her knowledge to create individualized looks for each guest. Sheridan is looking forward to furthering her career by doing in salon photo shoots and advanced training. Whether you are professional, fashion forward- or in between- Sheridan is a stylist you can trust. Ciara has been a stylist for 8 years and has spent the past 3 years mastering her skillset with Aveda. She specializes in layered cuts, curly hair, babylights, balayages and fashion colors. As our resident updo expert, she has competed in upstyle competitions and continues to enhance her technique. To complete your style for that special event, let her treat you to a glam make-up look. A double- hitter, she is also a licensed barber, doing straight razor shaves, fades and undercut designs. Passionate about Aveda and continuing education, Ciara is certain to personalize your style and leave you loving your new look! Kelsey has been styling hair with Aveda for 12 years. She has traveled East & West to continue her education. Her passion comes from a desire to make people feel beautiful from the inside out. She is inspired by new ideas from guests, style icons, fellow industry professionals and educators. She doesn't want to be someone that does your hair, she wants to be someone that makes your day. Rachel has been with us for 4 years and her clientele is growing fast! She considers herself very lucky to go to such a fun & creative job everyday. It is very important to her that her clients feel confident and comfortable throughout their service starting with a thorough consultation. Rachel specializes in custom haircuts and color for women, men, and children; along with special occasion styles and natural nails. She will make you fall in love with your hair again! Shay joined Salon Fleur de Lis in the spring of 2011 as a part of our Guest Services team. She has taken Aveda's Business Building classes as well as Aveda Product Education. She is extremely passionate about her job, and has grown into the Salon Coordinator position. Shay is sure to make your day from the minute you walk into the salon! Amanda started her journey in 2017. Seeking social connection and a creative workplace, she decided to pursue her dream of cosmetology school. It didn't take long for her to fall in love with Aveda’s unified culture and customer customization. After completing her internship, Amanda set her sights on continuing her education, fine tuning her skills with Aveda's color lines and the many products we have to offer. She is passionate about helping people discover the look they want to achieve and making them feel like their best selves. Kat has been working in the industry for 25 years. She has many talents such as hair, makeup, and nails. She has worked behind the scenes with models at Paul Mitchell hair shows and also styled hair for theWorld Ice Skating Championships in Orlando, FL with Redken. Kat continues her education with Aveda to learn trends and new techniques. She loves her clients and listens to their wants and needs to give them the best look for them and their lifestyle. After following owner Alicia through 3 salons as a client, Erin now has her dream job working for her. She has been been with the salon for 4 years. Erin is a true Aveda girl and loves to educate guests on what it can do for them too! Her true passion is color, everything from natural enhancements to any fun fashion trend! She specializes in fine hair and children’s cuts. Come to see Erin and she is sure to make you leave with a smile! Vik strives to give anyone a look that fits their personal lifestyle. She believes this is possible with a detailed consultation & continued education. She is always eager to learn the latest trends and cutting edge techniques that are always evolving. Being dual-licensed; she has a love for skin care, makeup, and brow artistry, while specializing in custom multi-dimensional colors. She really is a one stop shop for a day of self care. Lauren is our triple threat and one stop shop. Esthetician since 2007, she specializes in natural looking Bridal makeup and is our resident brow expert, with Facials being her first love. Massage Therapist since 2010 she has extensive knowledge of the body and has taken several advanced classes focusing on difficult to treat conditions such as Sciatica and Fibromyalgia. She is trained in most every massage modality. Lauren makes an effort to stay ahead of the trends and techniques attending several advanced classes a year and even teaching some hair classes in-salon. Curly hair, Up-dos, and braids are some of her favorites to do, but she welcomes all challenges. Her passion when it comes to hair is to “work with what you got”. She’ll help you embrace your hair and find the best style for YOU. We're growing – both in the size of our staff and in our efforts to reach out to the community. Every spring we participate in AVEDA's Earth Month Awareness Program benefiting the Mississippi River Initiative as part of the Missouri Audubon Society at Riverland. Locally we participate in Saint Louis Hills "ART IN THE PARK" 2016, 2017, 2018. Looking for a Position as an AVEDA stylist? Please call or come in and fill out an application. We are looking for experienced stylists with a passion for doing great hair!